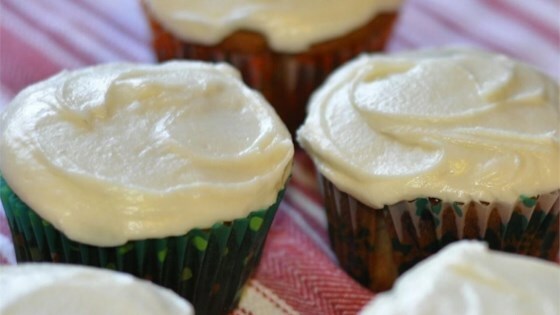 "Grandma Lottie's recipe for delicious banana frosting. This recipe produces enough frosting to frost the top and sides of 8- to 9-inch layer cakes. So easy and so yummy!" Beat banana and lemon juice in a bowl with an electric hand mixer set to Low until completely mixed. Beat butter into the banana mixture until creamy. Beat confectioners' sugar into the banana mixture in small batches, beating continually, until entirely integrated into a light and fluffy frosting. You’ll go bananas for these buttery bars! A nice change for all sorts of cupcakes - chocolate, banana, vanilla, peanut butter. Thanks for the recipe Mrs A. Love this recipe. However I did add in some vanilla and an 8 ounce block of cream cheese to mine and it was amazing. Thank you for posting this. To those who may think there is not enough banana in it, there is a simple solution. Add more banana. I had to say that because people complain about these sort of things a lot. Great recipe! I did add some vanilla and 3 TBSP of cocoa powder and used less sugar (judging the consistency as I mixed it). Perfect for the banana cake I’d made. Didn’t need a full batch, but was easy to cut in half. Loved it just as written!